My abstract submission for hyperrhiz: new media cultures. 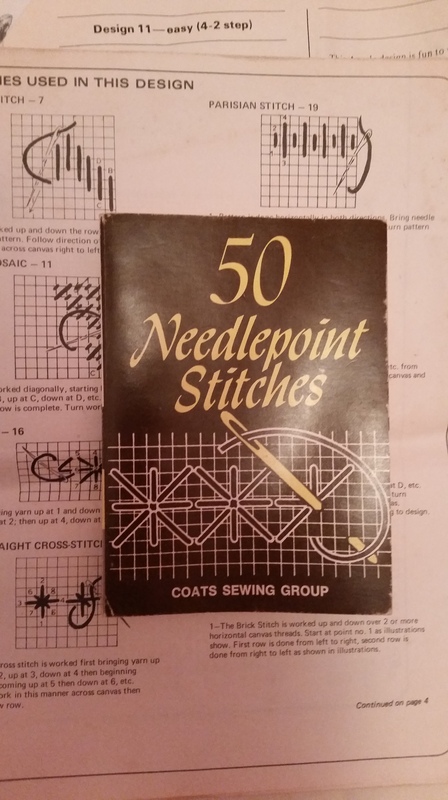 Call for papers on “kits, plans, schematics” here. 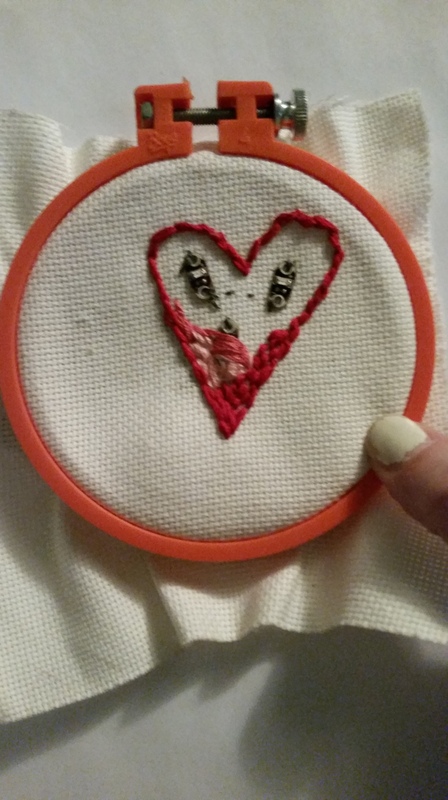 This ongoing project explores the queer feminist potentials of supplementing commercial design kits with objects and materials that are found, thrifted, or otherwise salvaged. In doing so, it mines the tensions between the useful and the decorative, technological sleekness and crafty kitsch, analog and digital. It also puts pressure on the boundary between cultural production and knowledge production, enacting a critical-creative praxis that values artistic practices as forms of theoretical work while simultaneously attending to the materialities and affective dimensions of scholarly labor. 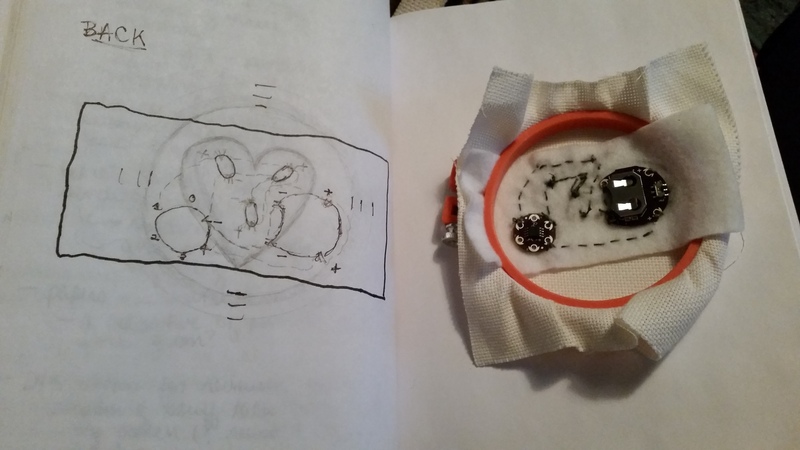 Using the LilyPad Design Kit for prototyping e-textiles with the LilyTiny (a microcontroller designed by Leah Buechley with four basic LED functions) and secondhand materials such as embroidery hoops, needlepoint pattern kits, yarn, and discarded objects, this series of textured fabric images is a media ecology that offers partial stories of queer love in feminist worlds. Here the slow work of crafting functions as a new materialist method of noticing and caring, while the aesthetics of documentation intimately attend to acts of queer making. 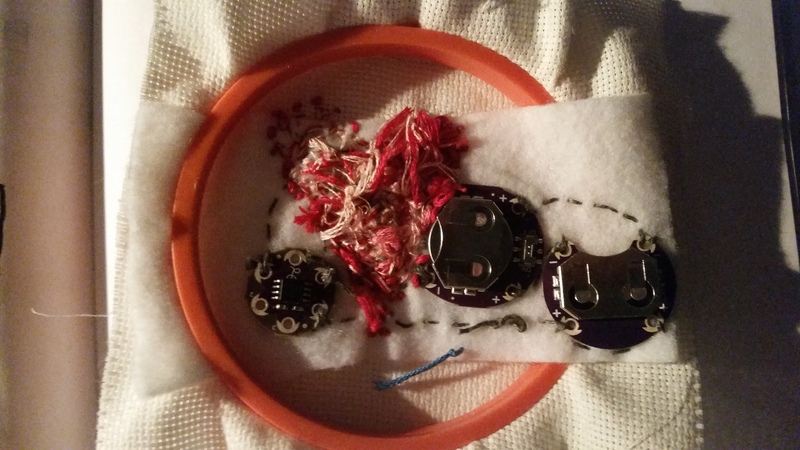 The accompanying essay explains all stages of the process, contextualizing the project in terms of feminist histories of craft and technology as well as recent scholarship on maker movements and DIY cultures. 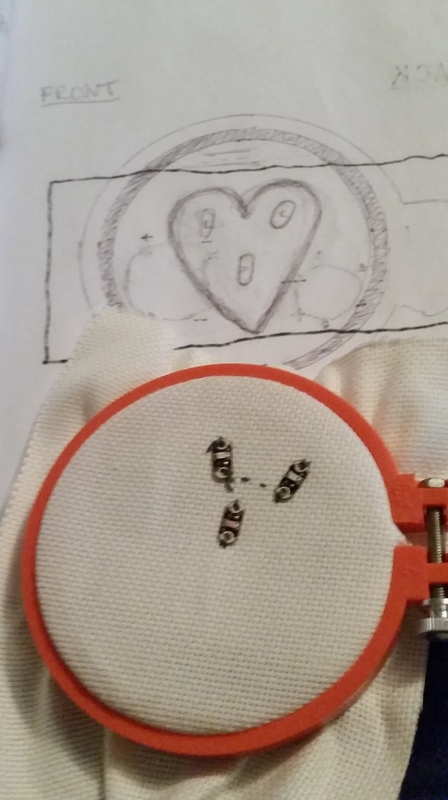 First I sketched the front of my design and laid out my LEDs (two red, one pink) on my smallest embroidery hoop. 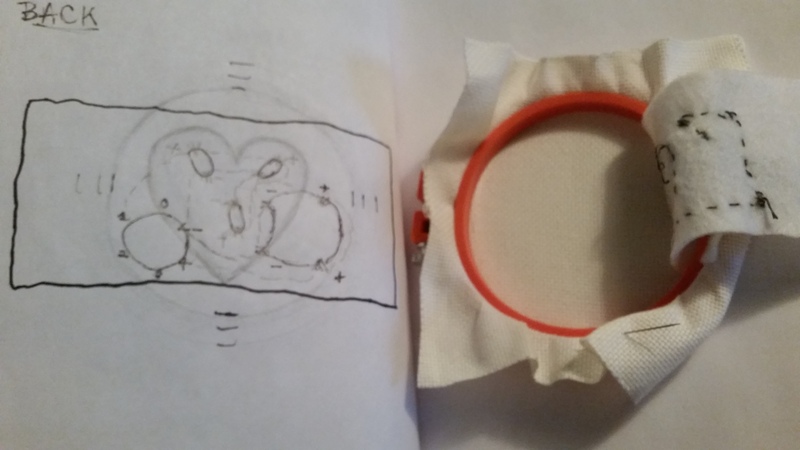 On the back of the design I sketched the circuit and marked where I wanted the battery and the LilyTiny. 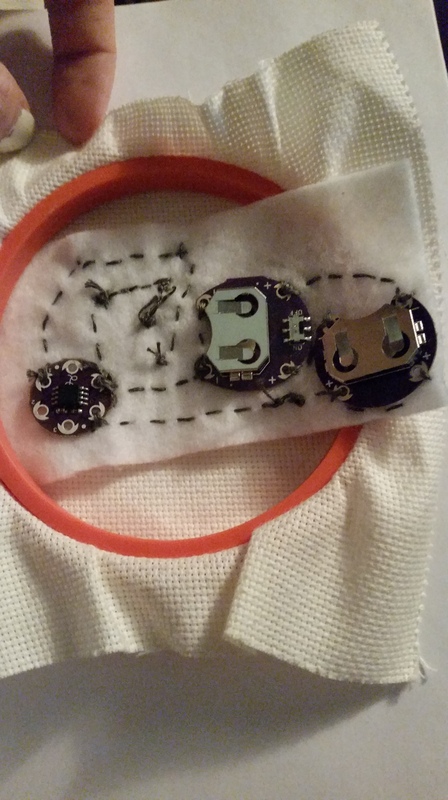 I sewed the circuit into a strip of felt so the conductive thread wouldn’t be visible on the front of the design (the conductive thread also marks up the Aida cloth with gray residue). The felt flips up so I could easily sew the LEDs onto the front of the Aida cloth. 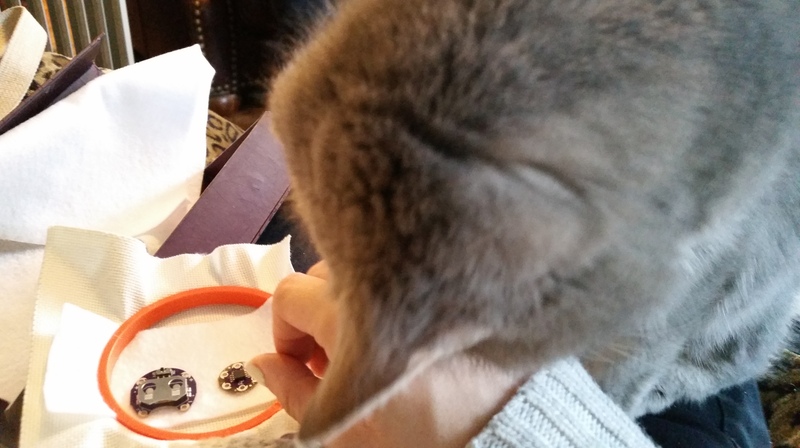 Zero is helping. I needed two batteries to run the pink LED. 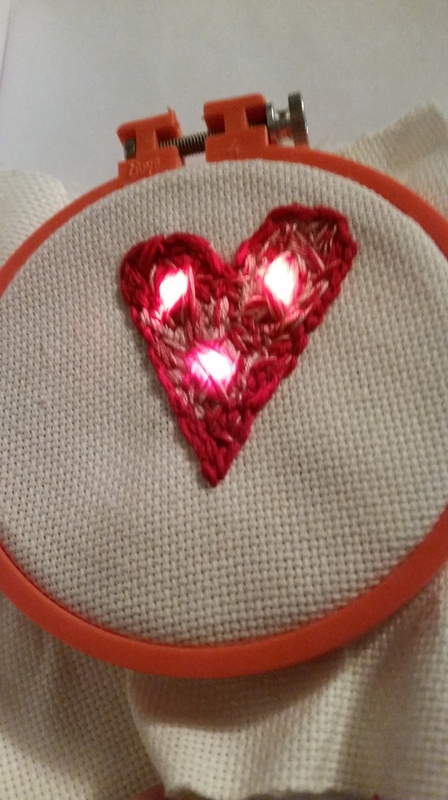 I’ll have to experiment with layering embroidery floss over LEDs to work on distributing the light. This is Part II in a diptych called “The Beginning” (Part I coming soon). 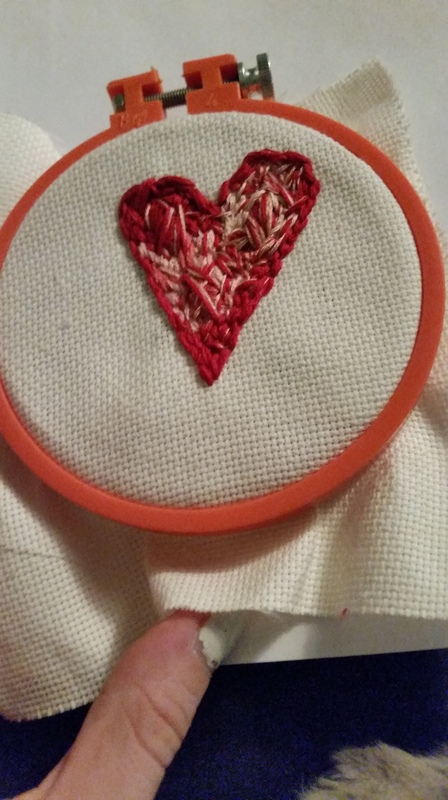 The back might be a little messy, but so are most hearts. 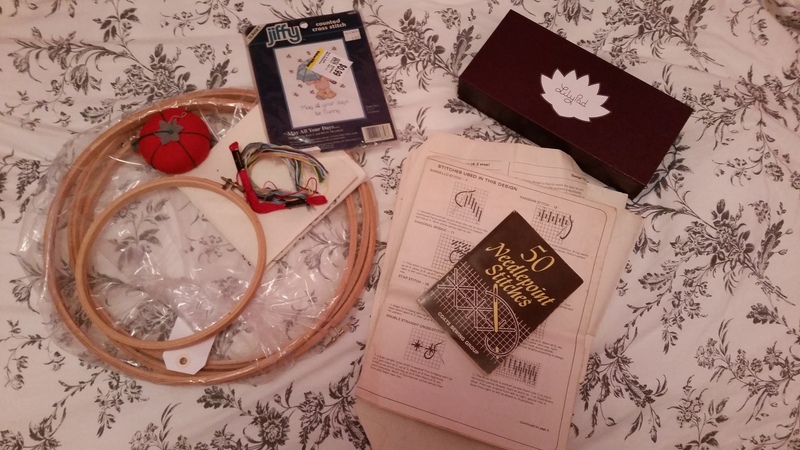 Two of the “kits” I’m working with: a LilyPad Design Kit and a bunch of thrift store embroidery supplies. 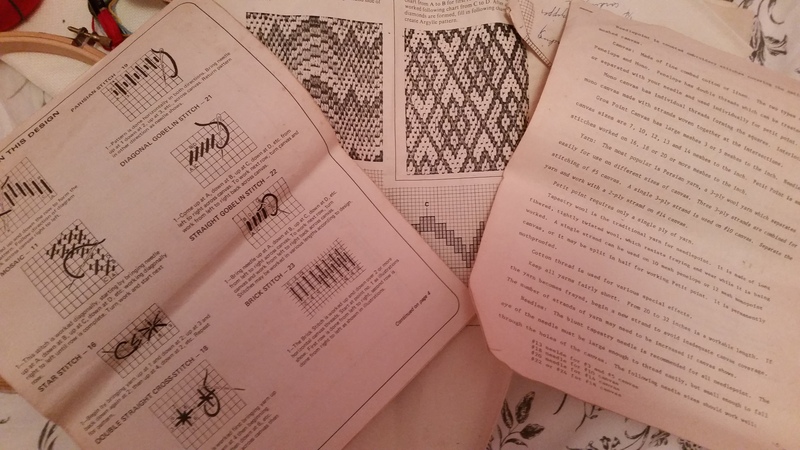 There are some great needlepoint instructions and even some handwritten patterns; I’ll have to do more research into provenance.